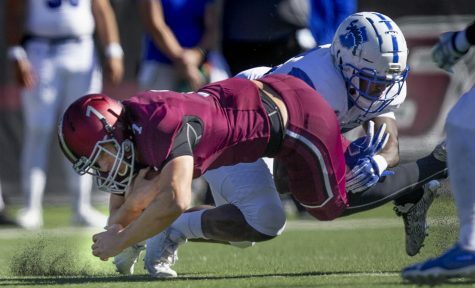 SIU football won its second game in a row with a 45-24 win over Indiana State University on Saturday. 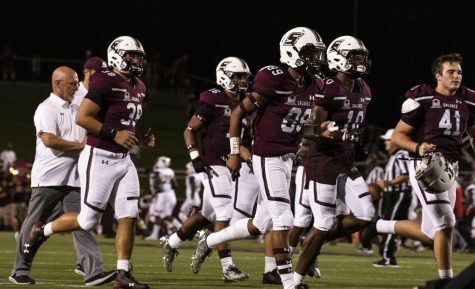 The victory gave the Salukis a 28-27 record against the Sycamores in the all-time series between the two rival school. After pulling off the upset against No. 15 Illinois State last week in Carbondale, the Salukis brought a tremendous amount of momentum to Terre Haute, Indiana against a winless ISU squad. After Indiana State spoiled SIU’s Homecoming in 2016, the Salukis were eager to return the favor this season. The Sycamores came out firing on their opening drive of the game. On the third play of the series, ISU junior quarterback Isaac Harker and senior wide receiver Bob Pugh teamed up for a 61-yard touchdown. 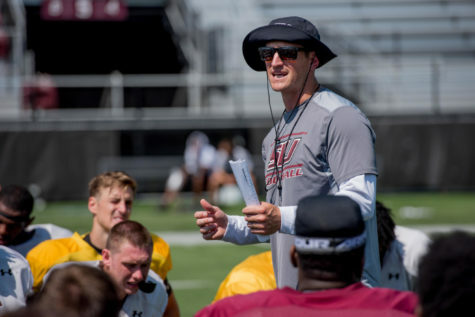 The Salukis answered back with a score of their own on their first possession when junior starting quarterback Sam Straub found his go-to red zone target this season — junior receiver Darrell James. The score was the sixth time that the two Salukis have hooked up for a TD this year. Indiana State kept the scoring trend alive on its ensuing possession by finding success in the running game. Senior running back LeMonte Booker was able to break a tackle from nine yards out and find the end zone, giving the Sycamores a 14-7 lead in the first quarter. The Salukis appeared as if they were about to score another TD on the next drive of the game when the offense marched the ball down to the 9-yard line. 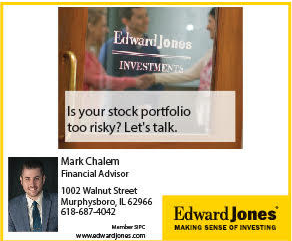 On the first-and-goal opportunity, Straub looked for James twice in the end zone but could not connect on either try, forcing the Salukis to settle for a 24-yard field goal by sophomore kicker Matt Sotiropoulos. 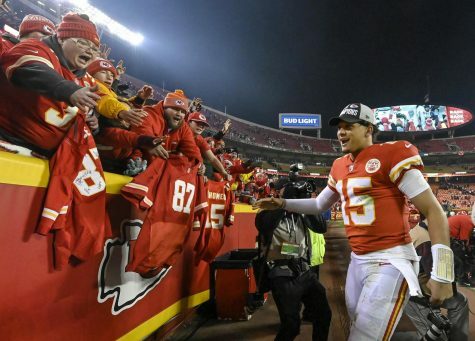 Down 14-10 in the first quarter, ISU could not convert during its drive and was forced to punt, giving the Salukis a chance to take their first lead of the game. The Dawgs were able to do just that with a six-play drive that ended in a touchdown catch from senior wide receiver Connor Iwema — his third of the season. After both offenses put on a show in the first quarter of play, the Salukis and Sycamores offense got stuck in idle in the second quarter. After Straub was intercepted by redshirt freshman Anthony Tucker to end the first quarter, Harker was intercepted three plays into the second by senior Saluki safety Ryan Neal. SIU took the turnover and marched down to ISU’s 23-yard line, but Straub’s shot at the end zone was picked off by Tucker for his second interception of the game. On the next possession, SIU’s offense drove to the 2-yard line but failed to score when junior running back Jonathan Mixon fumbled the ball on the 1-yard line, relinquishing control to ISU and ending the SIU threat. As the end of the first half neared, Straub hit James for a 61-yard catch and run that put the Salukis at the Sycamores 2-yard line. From the 2-yard line, junior running back Daquan Isom powered his way into the end zone for his second TD of the 2017 campaign, giving SIU a 24-14 lead. Before the clock hit zero, Indiana State got one more shot to narrow the gap. Harker was once again picked off by Neal on a near pick-six as time expired, keeping the 10-point SIU lead intact. The Salukis did not appear to bring their first half momentum with them on their opening drive of the second half. After three incomplete passes, a high snap went over the head of sophomore punter Lane Reazin, giving the ball to the Sycamores on SIU’s 8-yard line. 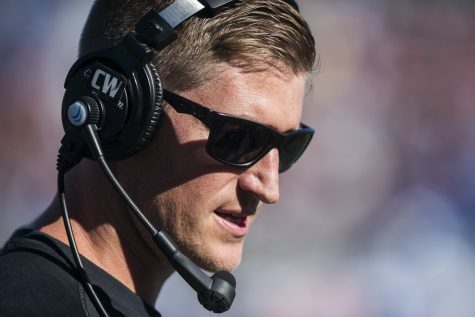 The Saluki defense took a strong goal-line stand against the Sycamores, forcing them to settle for a 21-yard field goal. Both squads remained quiet for most of the second half until Saluki sophomore safety Jeremy Chinn forced a fumble. SIU took the turnover and turned it into a 21-yard scoring drive, culminating with a 2-yard TD pass from Straub to Isom. The score was Isom’s second of the game and his first receiving touchdown on the season. 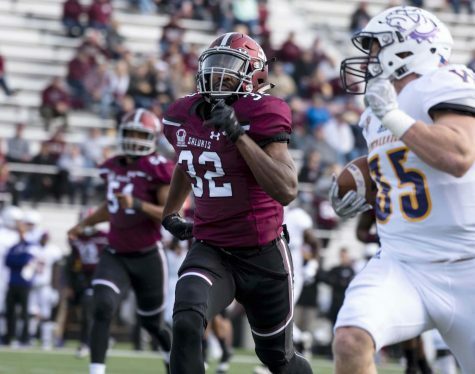 With a 31-17 lead, SIU’s offense took charge once again with big gains from Darrell James and sophomore running back D.J. Davis on its ensuing drive. Davis scampered in from the 4-yard line to give Southern a 38-17 lead late in the contest. The Salukis tried to put the game on ice with the run game but were backed up against their own goal line. Trying to keep the Sycamore defense guessing, the Salukis went to the air on third-and-eight and Straub’s pass was intercepted and run back for a touchdown by ISU junior cornerback Rondell Green, cutting SIU’s lead to 38-24 with eight minutes left in regulation. SIU’s defense stepped up to protect the lead when freshman defensive lineman Jaylin Wilson dropped ISU’s Harker on the 4-yard line, forcing a fumble that Southern recovered. Junior running back Jonathon Mixon took the first hand off of the ensuing drive to the end zone, giving the Salukis a 45-24 lead that they did not relinquish on their way to a victory over Indiana State. Straub threw for three touchdowns in the game on 352 passing yards and a 65.2 completion percentage. 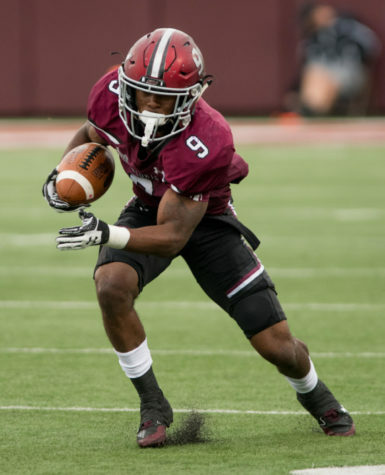 The SIU receiving corps was explosive once again with Darrell James turning seven catches into 154 yards and a touchdown. Junior Raphael Leonard also hauled in nine passes for 104 yards, with Iwema snagging three balls for 48 yards and a TD. Three SIU running backs — Davis, Isom and Mixon — rushed for touchdowns in the contest while combining for 124 rushing yards. 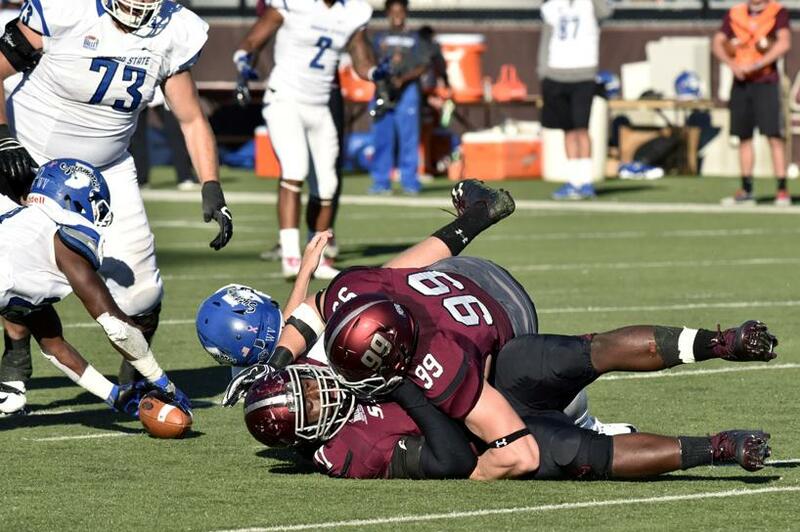 SIU’s defense overmatched the Indiana State offense with the help of eight tackles from Chinn. 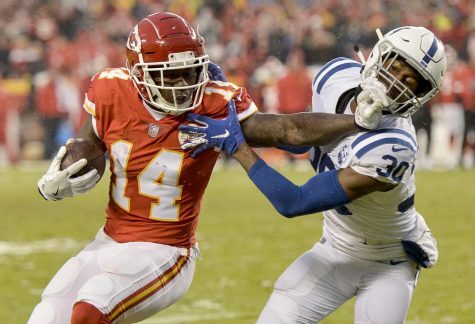 Neal also added three tackles to go along with two interceptions. 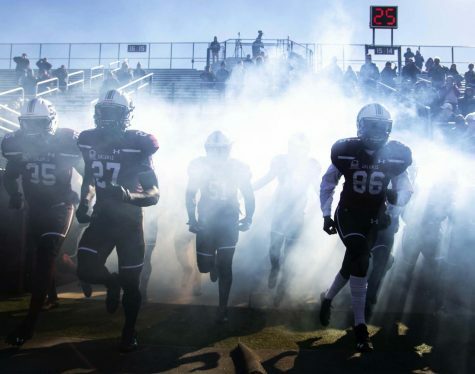 SIU (4-3, 2-2 MVFC) travels to Vermillion, South Dakota Saturday to face off against the University of South Dakota Coyotes (6-1, 3-1 MVFC) at the DakotaDome. 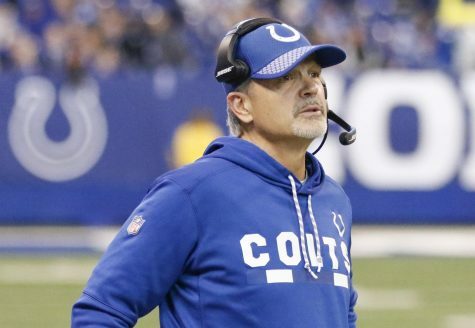 Kickoff is scheduled for 3 p.m.